Armenian citizens should have the right to demonstrate peacefully without police intervention. The police should upheld the rule and order and not become enforcers of the government against unarmed people. The Armenian people deserve better politicians than what we have. The leader of #MyStep movement, opposition MP Nikol Pashinyan has addressed the protesters at the Square of France in Yerevan downtown and called them to continue blocking the streets and hamper tomorrow’s parliamentary voting on election of Armenian prime minister. Pashinyan returned to the protesters after having treatment in hospital: he had been wounded in clashes at the Baghramyan Avenue. He called today’s protest actions a success, adding that the demonstrators managed to achieve a U-turn in the political situation in the country and prove that the people would not tolerate “Azerbaijanization” of Armenia. The politician called to block tomorrow all streets leading to the National Assembly. He said, all possible means are to be used for it. He also addressed residents of Yerevan suburbs calling them to close down interstate roads and come to the capital to participate in the action. “We need to start right now, streets are to be blockaded this night. Tomorrow, the whole Armenia should take to the streets; we should let this cursed session,” he stressed. He also announced that the actions must be decentralized, so that police could not concentrate in a single place. As EADaily reported earlier, after the constitutional reform was approved at a referendum in 2015, the country switched from the presidential to parliamentary system of governance. On April 9, Armen Sargsyan became president of the republic, while Serzh Sargsyan’s term was completed. Serzh Sargsyan can be the new Armenian prime minister who will accumulate all power levers in his hands. He is the only candidate of the ruling party that has a majority at the parliament. Mr. Sargsyan retire, go away! The presidents credibility is diminishing! YEREVAN.- Armenian President Armen Sarkissian issued a decree on Tuesday appointing Serzh Sargsyan as Prime Minister of Armenia, on basis of the decision of the National Assembly of Armenia to elect Serzh Sargsyan as Prime Minister of Armenia on April 17, 2018, the presidential press service reported. Congratulating Serzh Sargsyan, the President said, “considering the path you have passed, great organizational experience and skills, personality, I am convinced you will use all your potential in this responsible post for the development of our motherland and raising the welfare level of the people”. Armen Sarkissian wished the PM success and fruitful work. Tatevik Shahunyan. Oppositionists led by MP Nakol Pashinyan are now marching back to the "France" square. Before that, they had made a short stop on the Victory Bridge, where they were met by police. But Pashinyan urged his supporters not to offend the policemen: "They are our brothers, they are not to blame for being forced to carry out round-the-clock duty on the grounds of our actions, I apologize for the inconvenience, but we do this for your sake," Pashinyan said. , urging his supporters to applaud the police. At the same time he appealed to the police with a call not to use force against the people. The Armenian authorities still do not resort to any response actions, according to ArmInfo, Serzh Sargsyan ordered to wait "until the first sabotage." Meanwhile, Pashinyan himself stated that his actions will be exclusively peaceful. The Armenians of the Diaspora also expressed solidarity to the opposition, organizing protests in various countries and sending out financial assistance. If Sargsyan uses extreme force, it will be his eventual downfall and disgrace, so please avoid the bloodshed and resign you have enough money to retire. The Republican party instead of coming up with excuses as to why it is necessary to keep Serjik in power should have left Karen Karapetian (he is doing good job as PM)to finish its mandate and then decide what to do. I think people wouldn't mind if the Republican party have had appointed as PM someone different from Serj and that would have been end of the whole ordeal. Now it appears that the only way out is parliamentary elections. By announcing a boycotting of classes, students joined the movement of civil irregularities. They not only joined “Do Step, Reject Serzh “movement, but also conduct campaigns and close streets. Each and every student has reasons to come to the French Square or to participate in protests in different parts of the city. They are particularly frustrating that Serzh Sargsyan is breaking the promise that he made during the constitutional reforms. Young people point out that the imperfect political system and the poor state of the country have a direct bearing on their education. “The student should be a political but not a party member. The president of the Board of Trustees of my university is ex-President Serzh Sargsyan and his activity has a direct impact on the development of my university- YSU, its ruling party affects my country and my university, it sees any student. As a result of its power, emigration has reached enormous numbers, and not to mention the republicanization of the university,” said student Anna Rafyan. Armen Sarkissian said in an exclusive commentary for ARMENPRESS that the opinion of every citizen of Armenia is important for the country, however violence, illegal actions and the restriction of rights of others should be ruled out during freedom of _expression_. “Under the Constitution, parliamentary forces are entitled with nominating a candidate for Prime Minister of Armenia. The opposition can oppose the candidate of the parliamentary majority through its votes. It is also the right of any political force or citizen to freely express their opinion, approval or disapproval over a given political development, within the circle of their Constitutional rights – be it through a rally, demonstration or other peaceful means. The right to freedom of speech and free _expression_ of will is one of the most important values of democracy. The opinion of every citizen of the Republic of Armenia is important for the country. At the same time, violence, illegal actions and restriction of the rights of others must be ruled out during free _expression_ of will. The security of our country and national solidarity should be a primary and undisputed necessity for all of us. And, of course, I would like to once again emphasize that the health and life of every citizen of Armenia, from students, protesters to police officers, is valuable for us,” Sarkissian said in his first commentary to ARMENPRESS news agency as President. Dozens of protesters rallying against former President Serzh Sarkisian's election as prime minister were arrested on Thursday. Protesters held up a huge, upside-down official portrait of Sarkisian and shouted anti-government slogans. Led by opposition MP Nikol Pashinyan, more than two thousand protesters marched towards government headquarters in the afternoon where a cabinet meeting was under way. "Serzh Sarkisian...we came here to tell you that the people hate you!" Pashinyan shouted. "Armenians are ready to fight for their future, we will not stop, our victory is imminent," 26-year-old protester Misak Mesropyan told AFP at the rally. Another protester, pensioner Ruben, said: "Protests must continue if we want Serzh (Sarkisian) to finally step down." The influential head of the Armenian Apostolic Church, Catholicos Garegin II, expressed concern over the political turmoil. "Inciting hatred and enmity as well as any form of violence are unacceptable," he said in a statement. New President Armen Sarkisian, who is not related to his predecessor, said in a statement he invited "all parties to start dialogue to find the best way out of the situation". Earlier, several hundred demonstrators attempted to blockade the entrance to the government building before riot police intervened, arresting dozens and taking them to a local police station. Controversial constitutional amendments approved in 2015 have transferred governing powers from the presidency to the premier. Pashinyan -- who earlier announced the "start of a peaceful velvet revolution" –- has said the movement's objective is to bring about a change of leadership in Armenia through a nationwide campaign of civil disobedience. But the number of demonstrators has dwindled, down from roughly 40,000 on Tuesday evening -- the largest protest Armenia has seen in years. Sarkisian stepped down because of term limits, but he will continue to play the dominant role as prime minister under the new political system that envisages a mostly ceremonial role for president. About 15,000 rallied Wednesday at Yerevan's central Republic Square under slogans: "Make a step and reject Serzh." Smaller protests also have swept Armenia's second-largest city of Gyumri and a few other cities. Protests that began Friday have been mostly peaceful, except for Monday's clashes with police that left 46 people injured, including six police officers. On Wednesday, police unblocked some of the streets cut by protesters and detained 84 demonstrators, according to police spokesman Ashot Agaronian. He said that 30 of those detained already have been released and would face administrative charges. Protests began in Yerevan on Friday and have since spread to the country's second and third largest cities, Gyumri and Vanadzor. A former military officer, Serzh Sarkisian, 63, has been in charge of the landlocked South Caucasus nation of 2.9 million people for a decade. After he was first elected in 2008, 10 people died and hundreds were injured in bloody clashes between police and supporters of the defeated opposition candidate. Dozens of protesters have been arrested in the Armenian capital Yerevan after trying to break through a police line, protecting the entrance to government headquarters on the seventh day of anti-government protests. Demonstrators took to the streets a week ago in anticipation of the election of former-president Serzh Sarkisian to the position of prime minister on Tuesday. He amended the constitution in 2015 making Armenia a parliamentary system - leaving the president with a largely ceremonial role. Protesters say it is a cynical move to remain in office after serving his two presidential terms. The leader of the protests, opposition MP Nikol Pashinyan, is calling for nothing less than a 'peaceful velvet revolution'. "Pashinyan has been calling for change for many years," says Armine Ishkanian, an associate professor in the department of social policy at the London School of Economics. "Not everyone who is out in the streets necessarily supports him, but I think everyone who is protesting is sick of the regime and tired of the status quo." Pashinyan is urging protesters to continue their campaign of civil-disobedience. After seven days of demonstrations and dozens of arrests he has called on police to stop protecting government buildings. Observers say the biggest problem with the protests, is that they have no clear goals. "And that's the problem," says Juliana Melkumyan, associate professor of sociology at Yerevan State University. "When you protest against something you have to have alternatives." Armine Ishkanian agrees: "The people who are leading the movement need to have a plan for day three. "We saw this in Tahrir Square, we've seen this in lots of places where you can push in the square for revolutionary change but that doesn't mean you have a plan for action." As the protests spread to Gyumri and Vanadzor, the second and third largest cities not everybody believes that the protestors need a clear-cut objective. "They have an agenda for the future," says Vartan Kaprielian, director of AYP FM, a Paris-based Armenian language radio station. "They are preparing new generations for the change. They are creating the environment for the necessary change in mentalities. They are fighting the fear that exists in many former Soviet states." Why are Armenians protesting against the new prime minister? Tens of thousands take to the streets against nomination and appointment of ex-president Serzh Sargsyan as PM. The political situation in Armenia remains "fragile", according to analysts, as mass protests continue in the capital, Yerevan, for the seventh consecutive day. 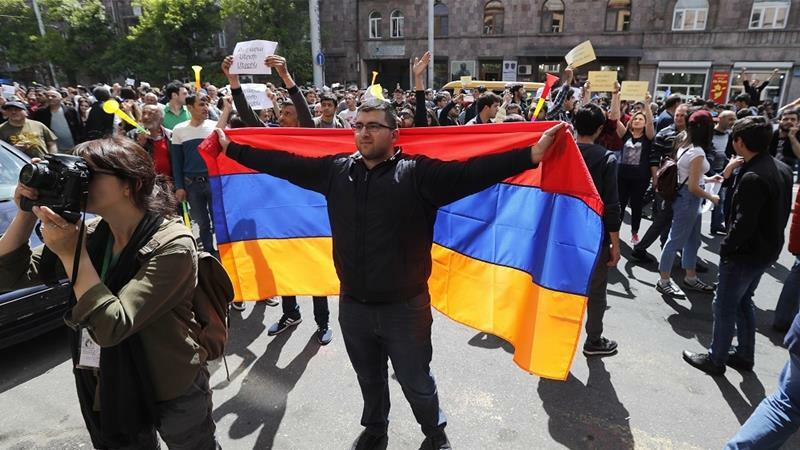 The protests began on April 13 after Armenia's ruling Republican Party nominated former President Serzh Sargsyan for the prime minister’s post earlier this month. Many Armenians do not want to see Sargsyan as the head of the state again, as his government has been accused of corruption and of allowing oligarchs to thrive. The 63-year-old leader had in the past promised not to run for the post of prime minister but was formally nominated by the Republican Party earlier this month. The country amended its constitution to change the government from a presidential to a parliamentary system in a 2015 referendum, making the presidency largely ceremonial and strengthening the office of the prime minister. This would allow Sargsyan, who served two consecutive terms as president until 2018, to maintain his influence on the politics of the country. "I participated in the protests because I no longer want to see my country ruled by Sargsyan's corrupt party and the oligarchy," Gayane Ghazaryan, a student protester, told Al Jazeera from Yerevan. "Most people have no jobs or get paid less than $100 a month. The elderly live on a pension of about $60 a month. I don’t want to see my people emigrate to Russia or elsewhere any more. I don’t want to see my country suffer any more. "Armenia is gradually turning from a democracy into a totalitarian regime," Ghazaryan continued. "We’re protesting because we want to see a country where there is equality and justice." The protest leader and opposition figure, Nikol Pashinian, declared a popular, non-violent "velvet revolution" in Armenia and urged demonstrators to keep besieging ministries, the prosecutor's office, the central bank and other governmental buildings. According to local media, activists were able to cut off almost the entire centre of the capital, barricading streets and even preventing the metro from running. The protests escalated on Thursday as people clashed with the police, resulting in several people being injured and more than 20 being arrested. "I personally know someone who's currently in the hospital with serious injuries," Mikael Zolyan, a political analyst based in Yerevan, told Al Jazeera. "However, so far the level of police violence has not been as bad as in 2008 when 10 people died in the clashes [with police]." According to Lara Aharonian, the director of a women's resource centre, Women of Armenia, "police used excessive and disproportionate force against thousands of peaceful protesters and arbitrarily arrested several activists to prevent them from reaching the Assembly on the day of the parliamentary vote to elect Sargsyan as prime minister on April 17". "Following that day, there were rallies and civil disobedience actions where peaceful protesters surrounded different government and administrative buildings in different parts of the city, announcing a general strike for students and workers to paralyse the whole city," she told Al Jazeera. But Zolyan, the analyst, says these protests are unlikely to hurt Sargsyan in the short-term and won't prevent him from keeping his post as prime minister. "But if the opposition succeeds in bringing a serious "fight" to him and demonstrating the will to fight to the end, Sargsyan's rule may not be as calm and long-running as he would like it to be," he told Al Jazeera. Armenian journalist Grigor Atanesian believes the unrest might bring about significant change. "A police station takeover in July 2016, followed by mass protests, resulted in Sargsyan bringing in a new prime minister, Karen Karapetyan, who launched a programme of economic reforms," Atanesian told Al Jazeera. The intensity and pace at which the protests have escalated, has come as a surprise to the authorities and analysts. As protests continue, it is hard to predict what turn they will take. "The situation is changing very fast, and the number of protesters grew from hundreds to tens of thousands in just ... days," Zolyan, the analyst, said. "In the coming days, it will be clear: either the government will crush the protests or the protests will be so huge, that they [authorities] won't be able to suppress them. And that will likely result in a scenario similar to what happened during the Arab Spring or during the Euromaidan in Ukraine, which brought about a change of government." However, according to Zolyan: "Any small incident can make or break this. It's a very tense and fragile situation." There was a discussion procedure for information on violence against journalist Tirayr Muradyan. Any case of hindrance to a journalist’s professional work should be immediately prevented, and hindrances should be subject to strict sanctions. The Ombudsman states that ensuring the regular work of journalists is important, especially when events of public significance occur. Serzh Sarkisian you will be held resposible for any bloodshed and history will not be kind to you, better listen to the people and resign. Dozens were arrested as hundreds of opposition supporters staged sit-ins and attempted to block road traffic in Armenia's capital yesterday to protest ex-president Serzh Sarkisian's election as prime minister. Many of the demonstrators waved national flags and held up placards reading "Sarkisian is a dictator". Some attempted to block roads in response to repeated calls by the leader of the protests, opposition MP Nikol Pashinyan to paralyse traffic. Police said dozens of people were detained. Since last Friday, opposition supporters have held rallies to denounce Sarkisian's efforts to remain in power as prime minister after a decade serving as president. Opposition parties have criticised the 63-year-old leader over poverty, corruption and the influence of powerful oligarchs in the country of 2.9 million people. The spokesman for Sarkisian's ruling Republican Party said the newly elected prime minister would not step down. "We respects citizens' right to freedom of assembly but we rule out the possibility of the prime minister resigning," Eduard Sharmazanov told journalists late Thursday. Human Rights Watch condemned the "arbitrary arrests" of demonstrators. "One should not underestimate the challenges Armenia's police are facing in maintaining law and order, but the ongoing protests are no justification to arbitrarily detain people," it said in a statement. Parliament elected Sarkisian as prime minister on Tuesday after he served a decade as president from 2008 under a new parliamentary system of government. In the biggest protest in Armenia in years, tens of thousands took to the streets over Sarkisian's election as prime minister on Tuesday night but the number of demonstrators has since dwindled. Some 15,000 rallied in Yerevan on Thursday night. YEREVAN. – A total of 23 people, among them the son of Nikol Pashinyan—“My Step” initiative leader, opposition Civil Contract Party member, and National Assembly (NA) of Armenia “Way Out” (Yelk) Faction head—on Friday were detained and taken to the central police department of capital city Yerevan. “Way Out” Faction MP Edmon Marukyan, who arrived at this police station, informed about the aforesaid. According to the police, eleven of these persons were detained for not obeying the police orders. Police officers, including those in civilian clothes, are detaining demonstrators, and, moreover, with non-police vehicles. Nikol Pashinyan on Thursday announced that on Friday, they will resume their protest action of total blockade of Yerevan streets. Also, he noted that they will close off subway stations, too, and called on everyone to either not go to work or to join them on Friday. Pashinyan and his supporters are staging protests in Yerevan ever since April 13, and by marching, holding rallies, as well as blocking streets and squares. They protest against ex-President Serzh Sargsyan being elected Prime Minister of Armenia. As a result of the clashes during these demonstrations, 46 people—including Pashinyan—were injured, and police detained several dozen people, including minors. In addition, a criminal case has been filed into the protesters’ bursting into the Public Radio of Armenia building and regarding an incident that occurred at an intersection in downtown Yerevan. Ex-President Serzh Sargsyan was elected Prime Minister at Tuesday’s NA special session, and by a vote of 77 for and 18 against. Dialogue after Serzh leaves politics altogether! YEREVAN (Reuters) - Armenian President Armen Sarkissian on Thursday called for dialogue, as thousands continued to protest on the streets against the appointment of the new prime minister, who was president for 10 years before switching jobs this month. Parliament on Tuesday voted to allow ex-president Serzh Sarksyan to become premier in the former Soviet republic, despite weeks of angry rallies against such a move. "I'm confident that the only solution is a dialogue and mutual respect," Sarkissian said in a statement. "As a leader of the country, I'm calling on the sides to hold a dialogue in order to find the best solution in the current situation." Thousands of opposition activists marched in the center of Yerevan on Thursday, waving national flags and chanting: "Make a stand, say no to Serzh". They blocked entrances to government buildings and staged sit-ins. In the evening about 15,000 protesters were massed in the main square. Police detained more than 120 activists. Sarksyan was president from 2008 until April 9 and demonstrators said he was switching jobs but clinging to power. Under a revised constitution approved by referendum in 2015, the prime minister will hold most power while the presidency becomes largely ceremonial. Sarksyan's ally Sarkissian was sworn in as president last week after being elected by parliament. Sarksyan said in March, while still president, he would become prime minister to allow him to share the benefit of his experience. Armenia seceded from the Soviet Union in 1991 but remains dependent on Russia for aid and investment. Many Armenians accuse the government of corruption and mishandling an economy that has struggled to overcome the legacy of central planning. Serzh you had two terms to fix the economy, now it's time for others to try, please resign and go! Foreign or domestic destabilization hinders Armenia’s economic growth. Human rights and freedoms are priorities, but they should be exercised within logic. Prime Minister of Armenia Serzh Sargsyan made such statement in an interview with local Shant TV. “If exercised within logic, basic human rights will in no way hamper economic development. But when they become unproportionate and grow into traffic jams in Yerevan, how can they have a positive effect?” Serzh Sargsyan said. He recalled that Armenia has had only a single year of domestic and foreign stability during recent years. “How many stable years did we have during these 10 years? I mean, both domestic and foreign stability. Perhaps, 2017 was the only year when no rallies were held in the streets and tourists could arrive in Yerevan and investors could invest. It was the only year and we registered economic growth of 7.5% that year. We need only few years, a few years to make that growth felt by the people. Of course, discontents happen anyway, because the better people live the more demands they have. Our task is to achieve a minimum level for the people to be able to realize at least half of their desires. That’s the problem,” the prime minister said. To recall, protests and civil disobedience actions initiated by Nikol Pashinyan, oppositionist MP, leader of #MyStep movement, are aimed against election of Serzh Sargsyan, the ex-president, leader of the ruling Republican Party of Armenia (RPA) as prime minister. Protesters planned to block the avenue leading to the parliament building on April 17 to prevent voting for Serzh Sargsyan’s election as prime minister. However, the police took unprecedented measures to lead parliamentarians into the building and ensure the voting. The parliament was surrounded with police, special equipment and wired fencing from all sides. Pashinyan announced a start of a “Velvet Revolution” and urged protesters to block governmental buildings. Today, on April 19, Pashinyan and his supporters planned to block the building of the Cabinet to prevent the first session with participation of Prime Minister Serzh Sargsyan. YEREVAN, April 20. /TASS/. The leader of Armenia's Civil Contract opposition party, MP Nikol Pashinyan, said at a protest rally in Yerevan on Friday evening that the opposition is ready for dialogue only on condition of resignation of Prime Minister Serzh Sargsyan, a TASS correspondent reported from the site. "We are ready for dialogue, but only after Serzh Sargsyan steps down. After that, the parliament will elect a "people’s candidate" to the post of prime minister. The Armenian constitution gives the prime minister and government 20 days to present their program. We will have a political agreement that the lawmakers would turn down this program, after which the parliament would be dissolved. And then, we will appoint extraordinary parliamentary polls," Pashinyan said. Mass rallies began in Yerevan and other cities of Armenia on Monday protesting against the nomination of former president Serzh Sargsyan’s candidacy for prime minister. On Tuesday, Sargsyan was elected prime minister. Nikol Pashinyan declared a ‘velvet revolution’ and urged his supporters to peaceful civil disobedience actions. On Thursday, opposition activists tried to break down a meeting of the new cabinet having clocked approaches to government buildings. Apart from that, they organized a 3,000-strong protest rally. Police detained 123 activists throughout the day. Protests continues into Friday, when 233 protesters were detained. I don't know why, but I feel this could be a false flag operation by the corrupt powers in order to undermine the protests and use force against unarmed civilians. YEREVAN. – The National Security Service of Armenia has distributed a video about prevention of terrorist attack. Earlier it was reported, that the Service was alerted about a criminal gang set up by A.B. and Sh. M. who earlier had contacts to Jirayr Sefilyan and Sasna Tsrer group. The gang planned to install explosive devices in public places, including at Liberty Square and Dalma Mall, under bridges, 100-150 meters far from residential buildings, in order to cause death or bodily injuries of law enforcers and other officials. Their actions were aimed at creating an atmosphere of fear and inserting pressure on the public administration bodies to make them fulfill their demands, the statement says. According to the National Security Service, A.B and Sh. M. manufactured and tested an explosive device, and tried to recruit other persons, promising them and their families a shelter in case of threat as well as financial assistance. A group of investigators conducted 19 searches in the apartments and vehicles and discovered powder filters, detonators, materials for improvised explosive devices. A.B. and Sh.M and other four suspects were detained.